Toronto's waterfront parks suffered a combined $28.3 million worth of flood and wind damage over the last year — but the city's Parks, Forestry and Recreation budget plan only covers 13 per cent of the repair work. Current capital funding includes $3.5 million to fix flood and wind damage, while the remaining $24.7 million "cannot be accommodated" within the Parks, Forestry and Recreation's 10-year debt targets, according to recommendations before Mayor John Tory's executive committee on Tuesday. 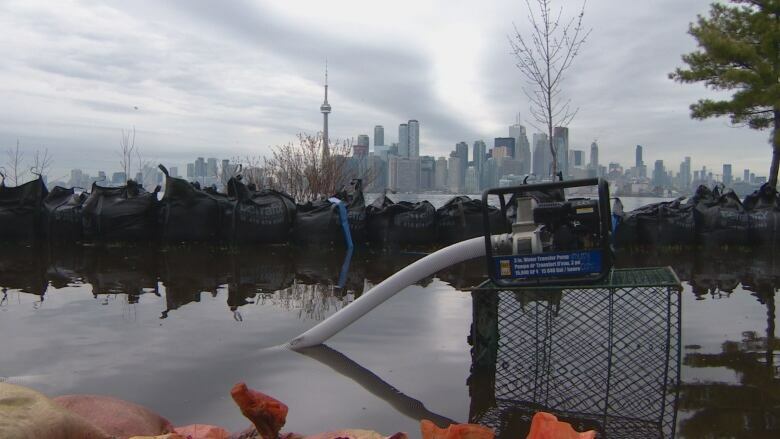 "We're trying to make sure that no further infrastructure is lost," said Toronto and Region Conservation Authority's waterfront specialist Nancy Gaffney. Tory stressed that he's committed to repairing the weather-related damage and protecting the waterfront from future storms — pointing out that the current 2018 repair budget is the "maximum amount of work staff believe we will be able to get done in one year. "We fully expect the additional funding for repairs will be approved as part of the 2019 budget debate," Tory said in a statement obtained by CBC Toronto. That debate won't take place until the fall, with approval slated for early next year. Lake Ontario hit its highest levels in 100 years in the spring of last year, creating problems across the length of the city's waterfront while also severely damaging the islands. The flooding began with April's snowmelt and was made worse by an exceptionally rainy spring. By May 27, 2017, the lake was 43 centimetres above its pre-flood level. 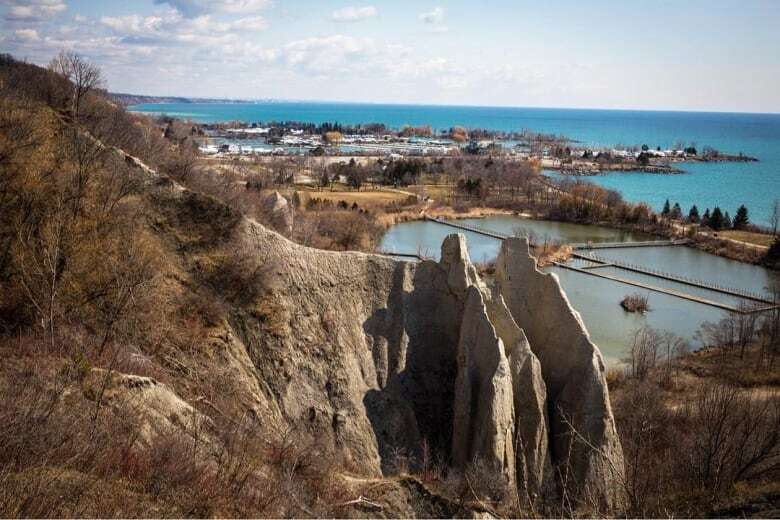 The Scarborough Bluffs also experienced an "unprecedented" 70 landslides along its banks. Toronto's waterfront took another beating this April when a fierce windstorm ripped through southern Ontario. The storm "exacerbated" shoreline damage — adding $11.8 million in repair costs to the already steep price tag, the report found. Much of the damage was caused by mammoth waves that hit record-setting heights, the tallest ever measured in Lake Ontario since recording commenced 45 years ago. "The damage sustained during this 24 hour period is of the same magnitude of the entirety of the flood event from 2017," the report read. Parks, Forestry and Recreation officials declined an interview about the budget shortfall, saying in a statement that "without repair, shoreline structures and waterfront parks are vulnerable to increased damages and public safety risk." 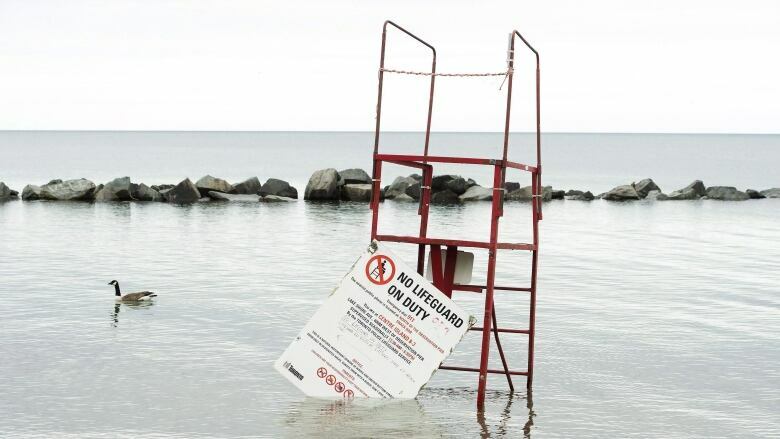 Bluffer's Park, located in Scarborough, requires $300,000 in "urgent" repairs to its aging infrastructure to combat rising water levels, explained Gaffney. "If waves continue to beat up that particular part of the shoreline, it may actually breach through into the interior embankment where all the boats in the marina are," she told CBC Toronto. "While it may not seem too much of an issue at first glance ... big winds come through and if it breaches that whole peninsula we could see a lot of damage and increased work having to be done if it starts pulling apart the whole area and all the infrastructure associated with it." Long-term repair planning, Gaffney points out, is required to curb damage caused by climate change-related storms — not just the completion of several emergency projects that provide a band-aid fix. 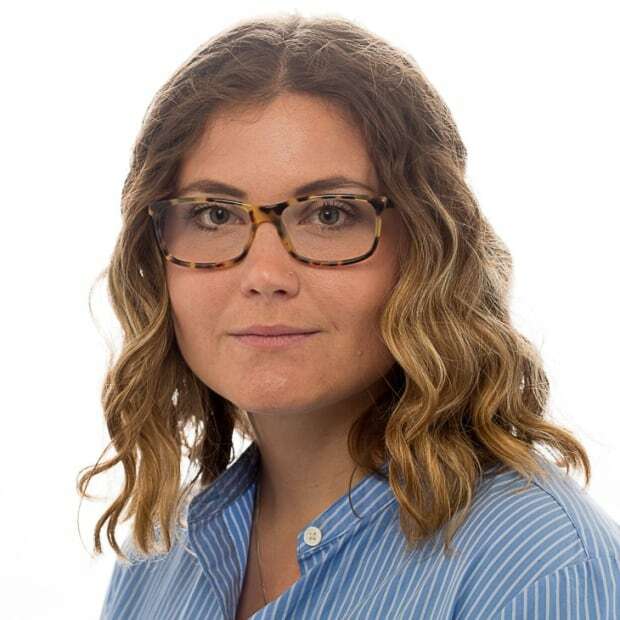 "We're trying to make sure that there's an additional layer of protection — whether it's sand bags or just some armour stones — and when the funding becomes available more comprehensive solutions will be put in place," she said. If more funding isn't secured, Gaffney anticipates other park spaces in the city might suffer. "We can look for all other monies, but it just means that our other priorities will have to change," she said. "Whether it's in the valleys and stream corridors, we will have to re-assess how important it is to move this money to the waterfront versus doing some high profile erosion control work inland." These types of storms, Parks, Forestry and Recreation officials predict, will grow more severe in coming years — further battering Toronto's waterfront if immediate action isn't taken to stabilize eroding shorelines and repair pathways. "With more extreme weather you have more frequent storms and more powerful storms so the shoreline starts to take a real pounding," said Gideon Forman, climate change analyst for the David Suzuki Foundation, noting Toronto Islands could see the most erosion and flooding in coming years. "In terms of people's ability to enjoy the islands and access them, for example, that's going to become more difficult."